You absolutely need imported Italian rice to make a proper risotto. I have tried cooking risotto with Indian rice but it does not work. Indian rice does not give the velvety texture of a risotto; it turns into a mush. Only the high starch content of the Italian rice delivers the proper texture of risotto. Actually there are three different varieties of Italian rice which are used for risotto: Arborio, Carnaroli and Vialone Nano. Occasionally you see Carnaroli rice for sale in India. Mostly I find Arborio rice in my favourite supermarket which is fine for risotto. Arborio rice is named after the town of Arborio in the Po Valley, where it is grown. During cooking these rounded grains remain firm releasing their starches slowly to form a smooth cream. Risotto is easy to cook, but you have to follow some simple rules to succeed. Most important is to avoid washing the rice as this would flush away some of the starch you need for your risotto. You use your Arborio straight from the packet. Very important is also to have a good stock. I usually take the liquid left over when boiling beef filet or silver roll in the pressure cooker. You can use any kind of stock you fancy, but don’t try to cook risotto with water. Risotto belongs to the dishes with endless variations. The procedure remains the same. First the rice is cooked briefly in butter or olive oil to coat each grain in a film of fat, called tostatura. Then liquid is added until the rice is almost cooked. At that point it is taken off the heat for the mantecatura: diced cold butter and finely grated Parmigiano or Grana cheese are vigorously stirred in to make the texture as creamy and smooth as possible. If the risotto contains fish or other seafood you don’t add cheese. 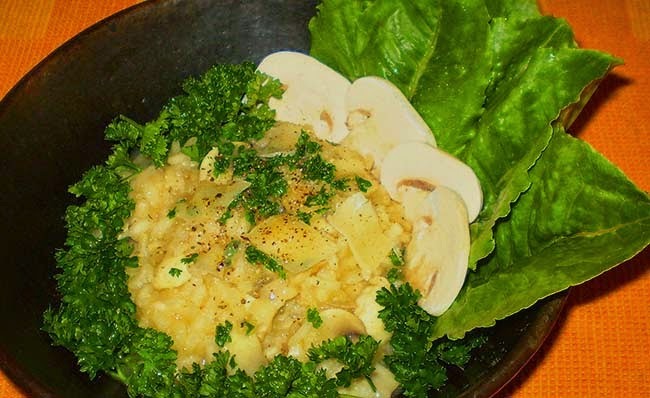 The mushroom risotto I present here is a simplified version of the traditional recipe. I cook all the vegetables and the rice together, instead of sautéing the mushrooms separately. In this way the white button mushrooms lend their full flavour to the rice. Be careful not to overcook the risotto. It should not turn into a stiff cream, but flow gently onto the plate. 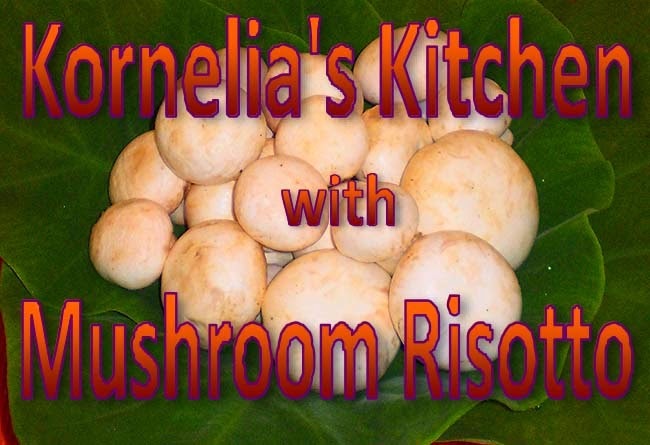 My son loves this mushroom risotto, that’s why I cook it regularly in my kitchen. It is a perfect dish for a rainy monsoon day. Wishing you happy cooking always! Peel the onions and chop them finely. I use a food processor for this. Peel the mushrooms and rinse them quickly under running water. Never keep mushrooms in a bowl of water, they will soak up the liquid and turn soggy. Wash the parsley and chop it finely. Heat the olive oil in a pan with high walls. Fry the onions on low heat until they turn translucent, and then add the rice without washing it. Keep on stirring for about two minutes until the rice is evenly coated with the oil-onion mixture. Add the first cup of stock and rise the temperature to medium. Keep on stirring until the liquid bubbles, and then add the second cup of stock. Some chefs recommend heating the stock, but I keep on forgetting this. In my kitchen cold stock works just as well, it just takes a little longer. When the rice mixture turns thick, add the third cup of stock. Slice your mushrooms and add them to the risotto. Keep on incorporating the liquid until you have used all the stock. At this point I have to tell you a secret. Most times I go against the rules and add all my stock in the beginning. I let it simmer for about five minutes before I incorporate the mushrooms. However, this is not the proper way to do it (although I have never noticed any difference). A risotto cooked in this way would probably not satisfy a real chef. My men never complained. All in all the risotto takes 18 to 20 minutes for cooking. During this time you have to keep on stirring occasionally to prevent it from sticking to the pan. Shortly before the end of the cooking time, add the chopped parsley. You can keep a bit of parsley to decorate the risotto when you serve it. Once the grains are soft but still have a bit of bite, remove the pan from the heat. Stir in the butter which you have diced. Then add half of the grated cheese and stir until your risotto has a rich, creamy texture. It should flow but not ooze out excess liquid. Serve it immediately with the rest of the grated cheese. Enjoy!